The Story of God continues. Recently, National Geographic announced they’ve renewed The Story of God with Morgan Freeman for a third season. (Washington, D.C./Pasadena, Calif. – Jan. 13, 2018) National Geographic announced today the greenlight of a third season of its Emmy-nominated hit series, The Story of God with Morgan Freeman, which has been hailed as “fascinating” and “eye-opening.” From executive producers Morgan Freeman, Lori McCreary and James Younger of Revelations Entertainment, the series premiered as National Geographic’s most-watched show of all time and is one of the most socially engaging shows across the network. In 2017 National Geographic expanded the critically acclaimed franchise by presenting The Story of Us with Morgan Freeman, a new series exploring how humanity is shaped by different fundamental forces that bring us all together. National Geographic also signed an exclusive first-look partnership deal with Revelations Entertainment with the vision of expanding the hit series franchise by developing even more thought-provoking and insightful nonfiction content. 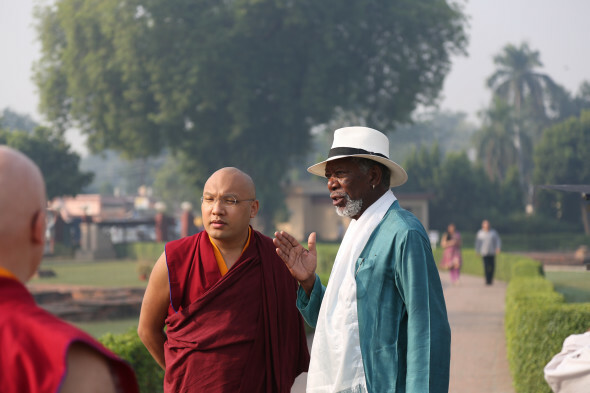 The third season of the series will again follow Academy Award-winning actor Freeman on an international journey as he discovers the power of religion and how it touches all of our lives. Freeman will travel to some of the world’s holiest sites and speak with religious leaders, scientists, historians and archaeologists to try to shed light on questions about the divine that have puzzled us from the beginning. Each episode will focus on a different topic about the divine to help shed light on the questions that inspired mankind. In the first two seasons, Freeman traveled to Jerusalem’s Wailing Wall, India’s Bodhi Tree, Mayan temples in Guatemala, the pyramids of Egypt, New Mexico to observe ancient Navajo rituals and the banks of the Ganges River. He explored lofty topics like creation, resurrection, the afterlife and the apocalypse, all in an effort to open dialogue about values and ideas, and to reveal the commonalities between different faiths and cultures. The Story of God with Morgan Freeman will air globally in 2019 on National Geographic Channel in 172 countries in 43 languages, and in Spanish on Nat Geo Mundo. What do you think? Have you seen The Story of God? Will you watch season three? More about: National Geographic Channel TV shows: canceled or renewed?, The Story of God with Morgan Freeman, The Story of God with Morgan Freeman: canceled or renewed? I watched the first season and it was ok I guess, but that was more than enough and I was surprised to see it resurrected for a second go around. I am not keen of the idea of having an atheist host called The Story of God. Freeman isn’t awful at it, but he isn’t particularly good either. It always felt like he was up to mocking the subject matter. Obviously, Freeman is 100 times preferrable to people like Bill Maher, Neil DeGrasse Tyson, and Deepak Chopra, all atheists who make their own strange claims on God. This is a great series to get to understand other people’s beliefs done in a respectful way. Very interesting.